Since I started taking a more active interest in photography, I view the world around me differently. I notice more sunsets, scenery, and beautiful flowers. I am constantly looking at the world as if I am going to take a picture. That's what happened tonight. When I walked outside and saw the sky and the way the fire looked against it, I ran inside to get my camera. A year ago I probably would not have even noticed. It is so enlightening to see the world in a new light. I hope I never stop. What a beautiful photo Jen! The contrasts are amazing. I understand looking at your surroundings differently than before. Isn't it amazing what having a camera can do to change how we view things? And, I LOVE this photo. The color of the fire and the color of the sky are EXACTLY the same! I know exactly what you mean. Same here! 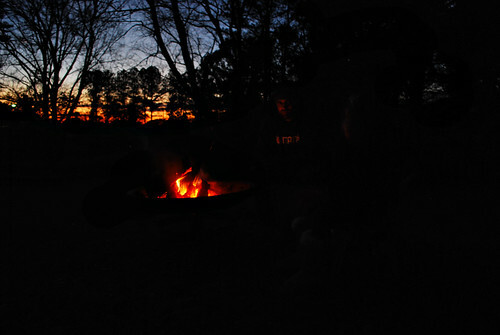 Love the matching fire and firy sky - great capture! I'm either happy I brought the camera or kicking myself for forgetting it! It's like seeing the world for the first time. I love how photography does that to us....it is my favorite thing about it...seeing the world through a different perspective! That shot makes me want a s'more and some hot chocolate! Just gorgeous! I do the same thing. I have even wished I had my camera a few times while driving to work and seeing the sky look a certain way or the way the snow fell on the road, etc. Oh yes, I see the world as if looking through my camera lens at all times! I think we now take teh time to notice the little things and beauties in this world. I love this! You really have a great eye!